Did you know that 4,000 people go missing everyday in the USA? Cate is honored to have been vetted and welcomed to be a part of the “Find Me” team. As an intuitive consultant, she will be using her psychic and medium gifts to help law enforcement and families when a loved one becomes missing or has lost their life through unusual circumstances. The Find Me group is a non-profit organization that was founded in 2002 and currently includes over 160 volunteers. The mission of Find Me is to work collectively with law enforcement agencies to bring resolution to unsolved missing persons cases and homicides. Volunteers have a background in a variety of skills and disciplines. They include active and retired law enforcement, intuitive consultants, search and rescue teams (air and ground) and other individuals who provide support and ancillary services. These resources collectively provide a different set of skills and tools to aid families and law enforcement where they might not otherwise have them available. There is no charge for these services or assistance provided through the Find Me group both at the local and federal levels. If you would like to learn more about this organization or would like to see how you can help, please visit the ‘Find Me’ group website by clicking on the button below. 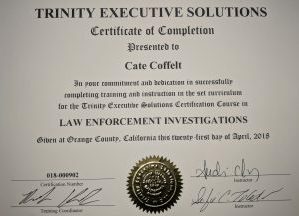 Cate is proud to announce completing the requirements to receive this certification in Law Enforcement Investigations. This course was special and unique in that it was taught by Los Angeles law enforcement detectives just for psychics. This course focused on the 4th Amendment and how psychics can best help law enforcement while assisting with missing person and unsolved cases.